About a year ago, my son was running late, he decided to grab a quick lunch at a convenient store. GI was never a problem, but on that day, his tummy probably didn't agree with the food he ate. He suffered from diarrhea for almost a week and since then, his tummy has become very sensitive. If he eats something too spicy, too fatty or if he ate too much, his tummy will act up that's why I always make sure he takes his daily dose of probiotic drinks. 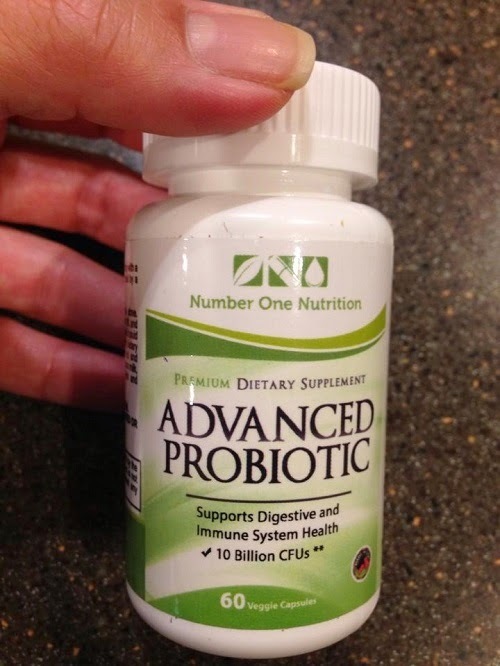 Then I was given the opportunity to review Advanced Probiotic by Number One Nutrition. It's an all natural formula, so I thought I'd let him try it. It might be too early to say because it's only been a week since he started taking it, but his tummy sensitivity did improve. He says he doesn't feel bloated anymore. Last Thursday was my dad's birthday and we had dinner at a buffet restaurant. He ate a lot; mostly sushi and sashimi, but nothing happened. No diarrhea and tummy ache! I also noticed that his pimples are starting to clear up, so I guess this is really what he needs. It's easy to swallow and very convenient. I'm also thinking of taking this because I read somewhere that probiotics also help you lose weight. You'll never know when and what food would agree with your tummy, taking probiotics may help improve your gastrointestinal tract. So far, my son has a very good experience with this product and I won't hesitate to recommend it to my readers. You can purchase Advanced Probiotics supplement on Amazon or on their website. For updates, you may also visit and like them on Facebook.